Make your web surfing faster, secure , private and flexible, great IE manage tool. 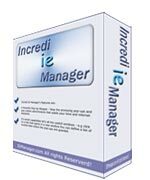 Incredi IE Manager is an unique tool for managing in a new and comfortable way the use of Microsoft Internet Explorer 5.5 and above. Enhance the capabilities of your browser to a different level with this multifunctional, easy to use program. Features include: powerful and customizing pop up blocker, spell checking , pictures and flash movies saving, favorites maintaining , privacy and security features and more ... Make your web surfing faster, secure , private and flexible. A Spell Checker - Check the edit fields for misspelings with just 2 clicks. Save Pictures And Flash Movies - Save all the images and flash movies on a web page even if context menus are disabled. Privacy & Security Suite - Protect your privacy with many useful options that give you total control of your web surfing experience. A Powerful Pop-Up Stopper - Stop the annoying pop-up and pop-under advertisments that waste your time and internet bandwith. Customize The Look Of New Windows - Let your browser always show it's toolbars, menu ,status bar and address bar. View Interpreted Source - View the html source of the pages you are visiting after the browser interpetes them. Favorites Checker - Check your favorites for availability and remove the broken links. Attribute Manager - power user tool to change all kind of file and folder attributes, date and time stamps. Net Chat 2.0 - An award-winning peer-to-peer local network Secure Instant Messaging Software and communications system for Windows.